Kingdom Konsultant Travel Blog: 5 Ways to Have Holiday Fun OUTSIDE of the Parks! What's not to adore about the smell of baking cookies and a fresh cut balsam fir? Or the sounds of sleigh bells and Christmas carols? The blinking lights on the tree and the favorite ornaments from years past? (Or, in our case, being that we live in Central Florida, the temps in the balmy 70's and our palm trees covered in twinkling lights.) I love it all! We didn't shop on Black Friday... we put up our decorations, lights and tree! (And had our traditional Round Two of Thanksgiving left-overs.) Of course, we have an all-Disney tree, filled with ornaments that we have collected from various park visits and cruises. It's a tree full of memories and I could stare at it all day! Anyway... Back to business. So, as most of you know, the holidays are a VERY busy time at Disney. 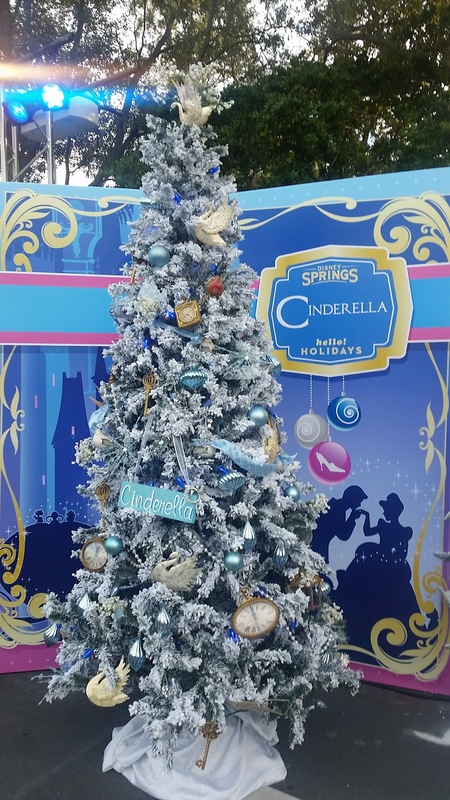 Thousands upon thousands of people flock to the parks to see the festive holiday decor, enjoy the sweet holiday treats, and partake in the various holiday festivities. It's a fun and beautiful time of year to be here, as well as a very, very crowded one. If you're not a crowd person, or even if the crowds don't necessarily bother you, but you don't have park admission, you don't need to miss out on the holiday fun. There are plenty of things you can do outside of the parks to keep the holiday spirit alive, so let's talk about some of my favorite ones! The ever-changing Disney Springs, formerly known as "Downtown Disney", is a fantastic place to go spend some time and get into the holiday mood. Of course it's the perfect place to do your holiday shopping, since there are tons of stores, ranging from the LEGO Store to Sefora, and The World of Disney to United World Soccer, (check out my non-Disney shopping guide HERE! ), but it's also a great place for holiday entertainment. Catch stilt-walking toy soldiers, dancing "snowflakes", special Hanukkah, Kwanzaa and Christmas entertainment and more. Want to see holiday decorations? There are poinsettias, Christmas trees, and over-sized ornaments all over! More interested in enjoying a festive holiday treat while you shop? There are two Starbucks locations where you can grab a Gingerbread Latte, or stop by Ghirardelli chocolate shop for the best hot cocoa you could imagine! Or even pick up a Christmasy confection at Goofy's Candy Co. And if you're interested in meeting the Man in the Red Suit, Disney Springs is a great place to do so, because of their "virtual queue line". This is like having a FastPass to see Santa. You check into a kiosk and are given an estimated wait time and a pager. You can then shop and enjoy Disney Springs to your heart's delight, and you'll be paged when it's time to come back and meet the Big Guy. Waaaay better than standing in a line for hours! And brand new this year, there's even MORE entertainment than before! 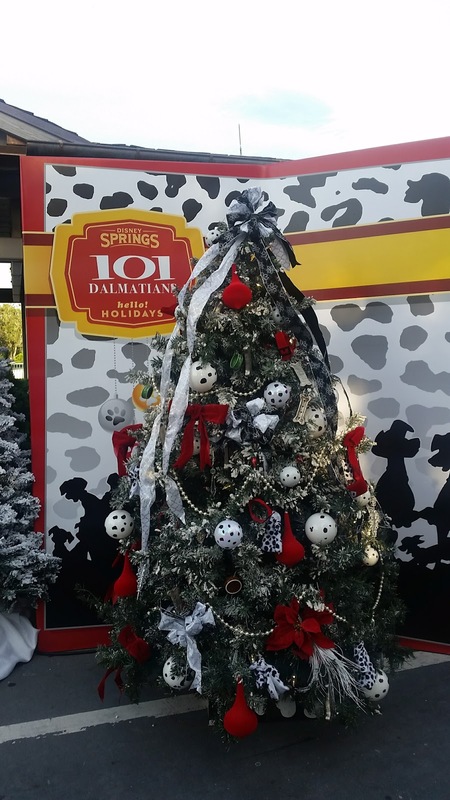 Whether you're visiting during the day or at nighttime, check out the Christmas Tree Trail, located behind Earl of Sandwich in the Marketplace area. This enchanting trail is adorned with 15 different Christmas trees, each themed to a different Disney film. 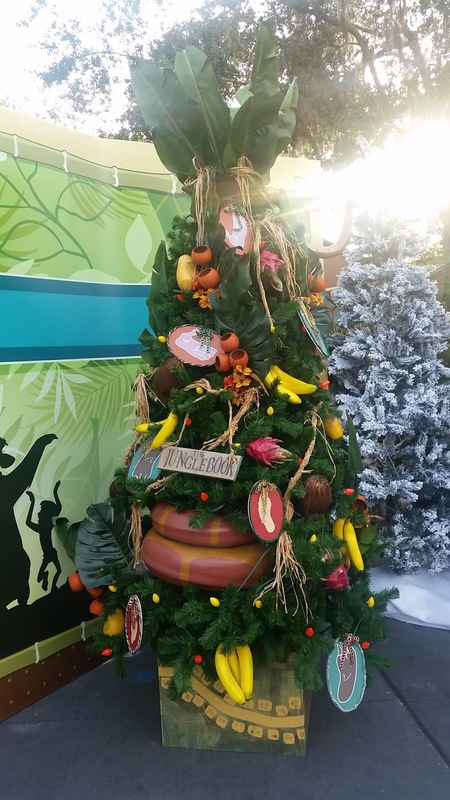 There's everything from an under the sea themed Little Mermaid tree, to an icy Frozen tree, and even a jungle-decor Jungle Book tree! The trail even gets some Florida "snow", for some extra magic! Plus, when nighttime rolls around, get ready to be amazed by Disney's newest technological wonder, Starbright Holidays! The show takes place over the lagoon, in the West Side, and is the first light show to feature drones creating holiday patterns across the sky. It's a short little show, but SO incredible to witness! I love of spending time at Fort Wilderness, and being there during the holidays is even better! During the month of December, typically the Campfire Movies that are shown are holiday-themed, like "Muppet Christmas Carol" and "The Santa Clause". There are also holiday sleigh rides to be had, but we will talk more about that later. A really fun and unique thing to do at Fort Wilderness in December is to walk, ride a bike, or even just ride the bus around the campground and check out the Guests' Christmas decorations. It's become customary, and somewhat of a competition, for the campground Guests to bring along their favorite lights, blow-ups, plastic figurines and even costumes and music, to make their campsite the most festive and fun that you have ever seen! It's something unexpected and delightfully fun to do on a cool December night! As I mentioned, Fort Wilderness is home to the Holiday Sleigh Ride. Most December evenings, (weather permitting), every 30 minutes, a one-horse-open carriage that is made up to look like a sleigh, departs from outside of Crockett's Tavern, for a ride through the backwoods of the campground. The sleigh is covered in holiday garlands and lights, and if you're lucky enough to get a nice, chilly night, you can bundle up under a blanket and enjoy the twenty five minute ride. The pricing is $79 per sleigh, and the carriage can accommodate up to 4 adults, or 2 adults and 3 small children. Though they can be done on a walk-up basis if the sleigh isn't booked up, reservations are highly recommended, and can be made with your Kingdom Konsultant agent. It's a perfect date night activity! In fact, this was one of the very first dates that The Hubs and I went on! The Grand Floridian is widely regarded for its incredible gingerbread house display. The whole lobby smells of the sweet and spicy cookies that cover an elegant, Victorian style shop, which actually sells holiday treats from a window. The house band, The Grand Floridian Society Orchestra, plays holiday tunes, and the huge, ornate Christmas tree can't be missed. The Contemporary also has a fantastic gingerbread display, theirs being themed to Frozen. My daughter loves checking out the cookie versions of Anna and Elsa, in front of their iced cookie palace! Make sure you hop off of the monorail line and take a detour over to The Wilderness Lodge. I think their holiday decor is the best! The rustic theme of the Lodge lends itself nicely to that warm, homey holiday feeling. Their tree is truly a stunner, and stands over 4 stories tall! So, there's just a few ideas for you! To schedule any of these events, or for more fun ideas, contact the crew here at Kingdom Konsultant Travel! They can help you dream up all kinds of holiday fun, but in the meantime, my kids are making their Christmas list and I think I just saw them put some $200+ items on there, so I'm gonna run! Happy Holidays, everyone!!!! !